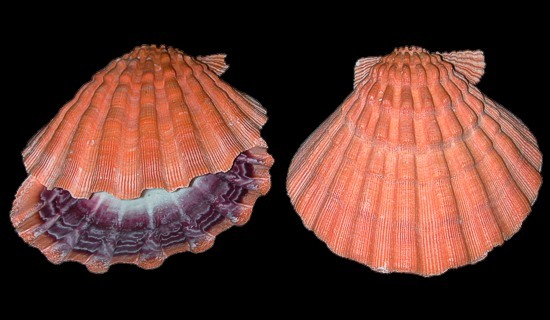 The Irish Flat Scallop is a bivalve shell. This means the mollusk has created a bottom shell and a matching top shell joint together by a ligament. Most scallops have been gathered for centuries as food. The young scallops usually attach themselves to hard objects with their byssus. 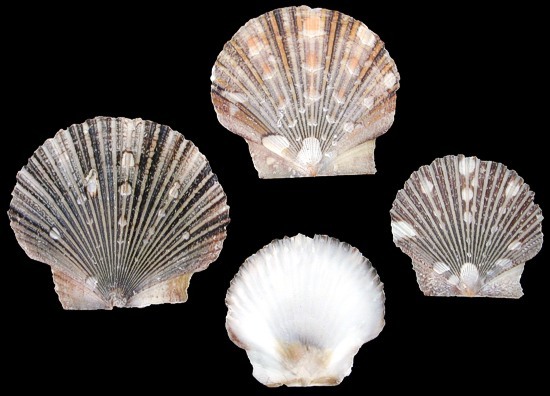 Irish Flat Scallops like other scallops prefer offshore sandy or stone filled sea floors. Scallops are found worldwide. IRISH BAKING SCALLOPS Some blemishes and predator marks are common on outside of shell. Irish Baking Scallops are Bivalves This means the mollusk (animal that lives inside the shell) creates a top shell and a matching bottom shell hinged by a ligament. Scallops are found world wide. For centuries scallops have been an important food source. The Irish Baking Scallop is most recognized for their use in baking and table decor. The Irish Baker prefers sandy bottom or pebbled sea floor. The Irish Baker color varies from brown, cream to almost pure white. MEXICAN DEEP SCALLOP SHELLS These are bivalve shells. This means the mollusk has created a bottom shell and a matching top shell, joint together by a ligament. Most scallops have been gathered for centuries as food. The young scallops usually attach themselves to hard objects with their byssus. Mexican Deep Scallops, like other scallops prefer offshore sandy or stone filled sea floors. These Scallops are found in the Eastern Pacific. 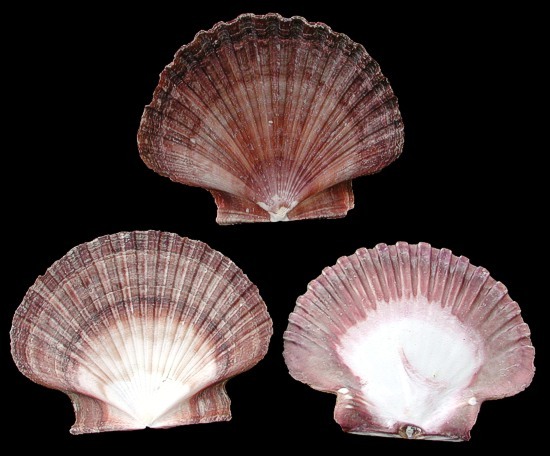 MEXICAN FLAT SCALLOP SHELLS The Mexican Flat Scallop is a bivalve shell. This means the mollusk has created a bottom shell and a matching top shell joint together by a ligament. Most scallops have been gathered for centuries as food. The young scallops usually attach themselves to hard objects with their byssus. 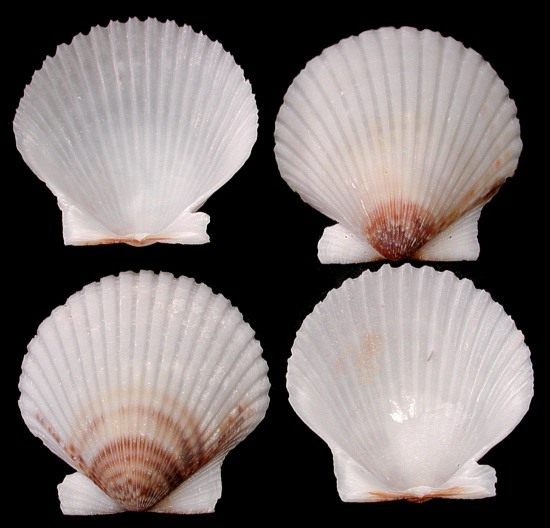 Mexican Flat Scallops, like other scallops prefer offshore sandy or stone filled sea floors. Scallops are found worldwide. BABY FLAT SCALLOP SHELLS The Baby Flat Scallop is a bivalve shell. This means the mollusk has created a bottom shell and a matching top shell joint together by a ligament. Most scallops have been gathered for centuries as food. The young scallops usually attach themselves to hard objects with their byssus. Baby Flat Scallops like other scallops prefer offshore sandy or stone filled sea floors. Scallops are found worldwide. 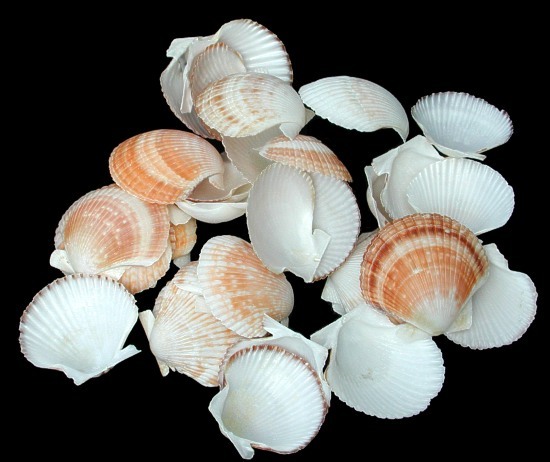 FLORIDA SCALLOP SHELLS The Florida Scallop is a bivalve shell. This means the mollusk has created a bottom shell and a matching top shell joint together by a ligament. The Florida Scallops we are offering are not matching pairs; rather they are a mix of upper and lower Florida Scallops, called singles. Most scallops have been gathered for centuries as food. The young scallops usually attach themselves to hard objects with their byssus. Florida Scallops like other scallops prefer off shore sandy or stone filled sea floors. Scallops are found worldwide. 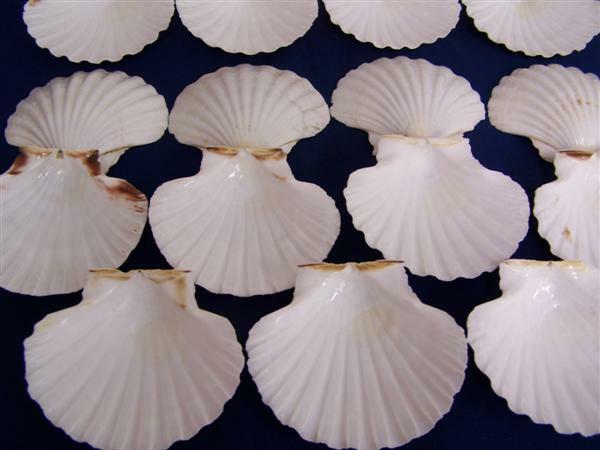 CALICO SCALLOP SINGLES Description.These are the best known of the bivalves. The Calico and other scallop species are fan shaped with unequal sized ears on either size of the umbones. The ear is an extension of the hinge region of the bivalve shell. 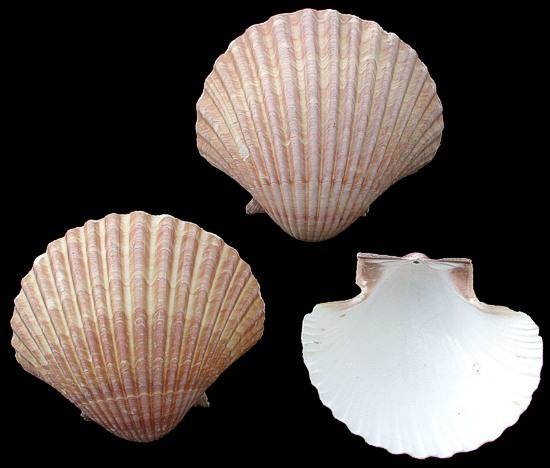 The umbo (umbones plural) is the earliest formed part of a bivalve shell's valve. 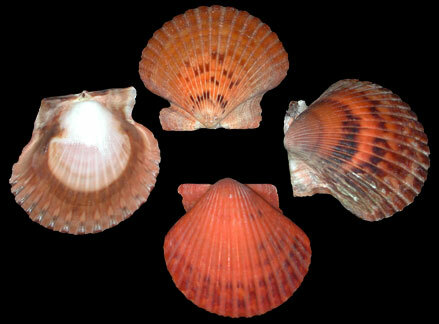 The Calico Scallop is abundant off the Southeast U.S. and Caribbean. The have been a popular shell among jewelry crafters. 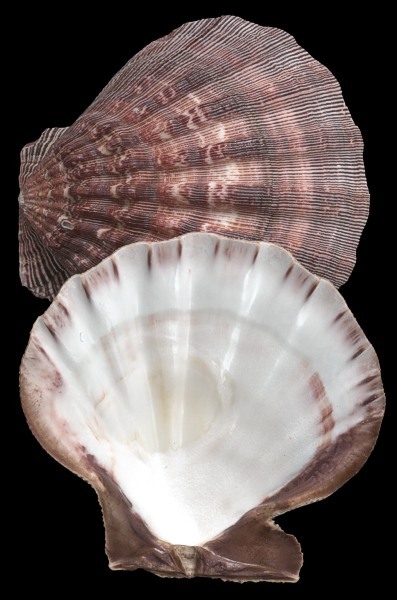 The Calico Scallops are sold as single shells not as complete bivalve upper and lower matching shell pair. LIONS PAW SCALLOPS Some blemishes and predator marks on outside of shell are common. Description Lions Paw Scallops are bivalve Mollusks (a soft-bodied, legless, invertebrate animal that usually secretes a calcareous shell). Bivalve means, they have an upper and matching lower shell that is hinged together. 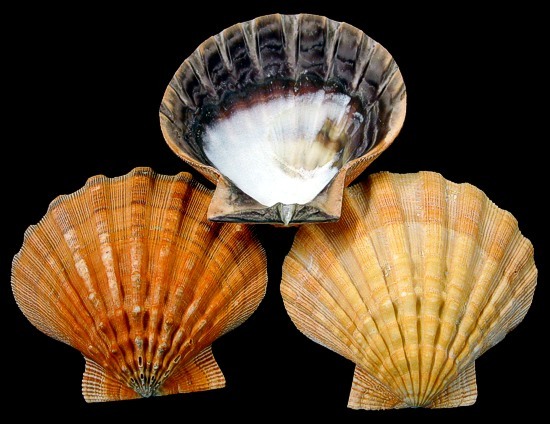 This listing offers both single shell and matching upper and lower shell pairs. Scallops move by opening and closing their hinged upper and lower shells; this action jettisons out water allowing the animal to move through its off shore water environment. The Lions Paw is a heavy shell. 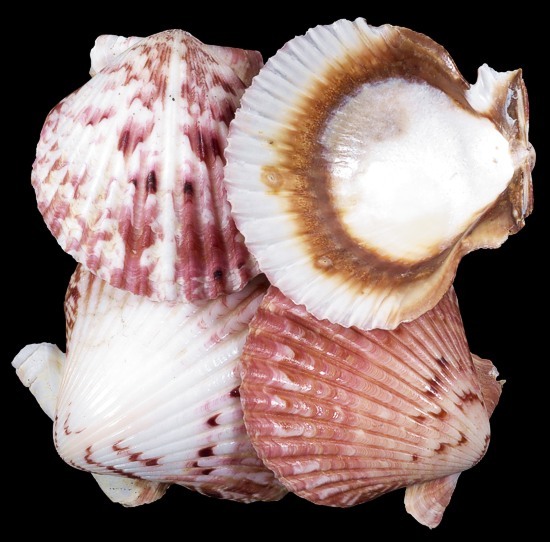 The shell color varies from dark or bright red, orange and yellow. The Lions Paw ranges from the Gulf of Mexico, across the Caribbean to along the Atlantic facing shores of North and Northeast South America. LION'S PAW PAIR SCALLOP SHELL(LYROPECTNEN NODOSUS This bivalve shell is in the Scallop family. Some blemishes and predator marks are common on outside of shell. The Lion's Paw is a thick heavy shell its width. The color is dark or light red, orange (primary color) and yellow. Our Lion's Paws are in their natural state. They will show natural occurring blemishes and battle scars. These are great collector shells but not considered gallery perfect. Lion's Paws are found off shore in the West Indies and along the Atlantic coast of South America, south to Argentina. ORANGE LIONS PAW SCALLOP SHELL SINGLES Some blemishes and predator marks are common on outside of shell. DescriptionOrange Lions Paws are bivalve Mollusks (a soft-bodied, legless, invertebrate animal that usually secretes a calcareous shell). Bivalve means, they have an upper and matching lower shell that is hinged together. This listing offers an assortment of upper and lower shells of the bivalve, not matching pairs. Scallops move by opening and closing their hinged upper and lower shells; this action jettisons out water allowing the animal to move through its off shore water environment. The Lions Paw is a heavy shell. 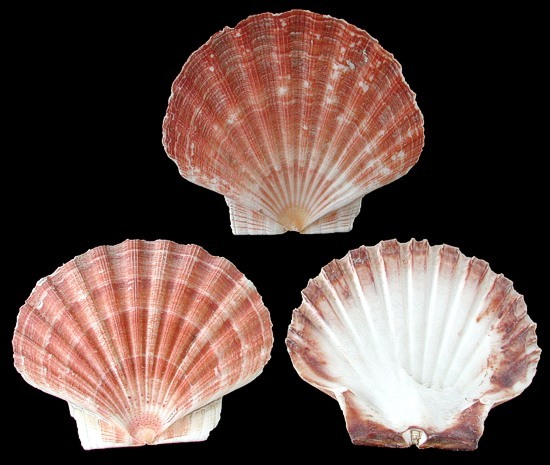 The shell color varies from dark or bright red, orange and yellow. The Lions Paw ranges from the Gulf of Mexico, across the Caribbean to along the Atlantic facing shores of North and Northeast South America.